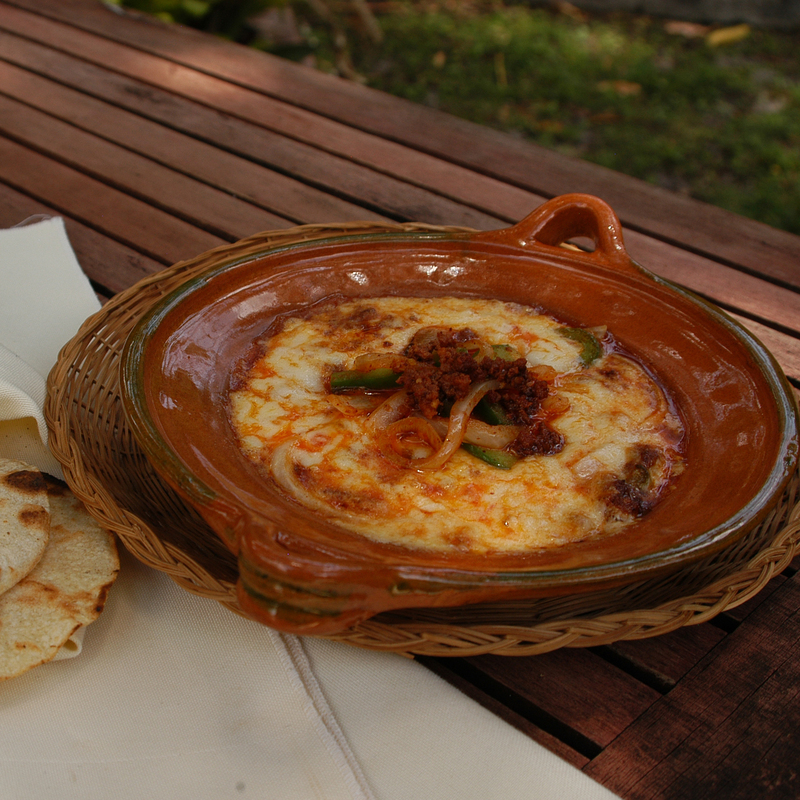 Our exclusive design for this Mini Flat Cazuela is perfect for making Queso Fundido, or for individual serving sizes. It’s beautiful glazed finish make a great presentation. The Cazuela is well-known throughout Mexico and can be found in just about any Mexican kitchen. They are an essential tool for Mexican cuisine and lend an authentic flavor and ambience to any Mexican table. They are widely used to prepare and serve many traditional dishes such as stews and casserole-style dishes, and great for slow cooking moles, which when simmered over an open flame acquire a special smoky taste. Our Cazuelas come from the semi-desert region in the Mexican state of Hidalgo, where they are laboriously made by hand by our experienced artisans using 100% lead free glazes. They are certified lead free and completely safe for food use. The pieces can be used in the oven, microwave, stovetop, or even direct flames, and can go directly to the table for an authentic presentation. The pieces can be used on a gas or electric range, however, a heat diffuser is recommended on electric ranges. And unlike other Cazuelas, ours are glazed inside and out making cleanup a breeze. The heat diffuser (which can be used with gas stove as well) has the added benefit of distributing the heat slowly to prevent foods from burning. Clay cookware can also be used on induction cooktops with the use of an induction cookware interface disk. A Mexican Clay Cazuela is not only beautiful, but also quite sturdy and will last many years with proper use and care. As with other clay cookware, the flavor of the food cooked in it actually improves with use. The pieces can be used in the oven, microwave, stovetop, or even direct flames, and can go directly to the table for an authentic presentation. The pieces can be used on a gas or electric range, however, a heat diffuser is recommended on electric ranges. The heat diffuser (which can be used with gas stove as well) has the added benefit of distributing the heat slowly to prevent foods from burning. Clay cookware can also be used on induction cooktops with the use of an induction cookware interface disk. As with any clay or glass cookware, the pieces must not be submitted to drastic changes in temperature. The pieces should be allowed to slowly adjust to heat, letting the pieces slowly heat up until they are hot. Likewise, always allow the pieces to cool to room temperature before washing or storing them, and never set a hot pot on a cold surface such as granite or tile. Our Cazuelas, unlike others, are glazed inside and out making cleanup a breeze. The pieces should never be placed in a dishwasher, but should only be washed by handed with warm soapy water. If heavily soiled, fill the pieces with warm soapy water and allow it to soak briefly, then scrubbing lightly with a sponge or soft cloth. Never use metal or abrasive cleaners, and always try to avoid strongly scented soaps which can flavor the clay. Never use metal utensils, as it can scratch and damage the inside of the pieces, using wooden utensils instead. It is common for some staining or discoloration on the interior of the pieces to occur with use over time. As with most products which are handmade by artisans around the world, the pieces may have slight imperfections in the form or finish of the materials, or on the glazed designs. Sometimes sizes of same model pieces may also vary slightly, however, these imperfection do not compromise the aesthetics or functionality of the pieces and are considered normal and expected. Likewise, although lids are made individually to match each pot, they may not always fit perfectly as the two parts may shrink differently during the firing process. Our Cazuelas are made from very fine clay and may be used after slowly bringing some water to the boil and need no further curing. The Cazuelas do benefit however from seasoning it prior to its first use, which can be simply accomplished by adding a couple of peeled garlic cloves to the boiling water use to cure the Cazuela. The seasoning on the surface will increase with use; adding its signature flavor to the items cooked in it, and over time actually become naturally nonstick and requires low maintenance. I like this a lot! I am planning on buying a few more. It is very attractive and nice to serve appetizers etc. Very beautiful - does everything stated and we like it so much, we just ordered the #3, 11" bowl. We plan on ordering more styles in the future. You`ll get hooked once you`ve used it. Be prepared to buy more.